Sir Isaac Newton was a brilliant scientist who lived about 300 years ago (1642-1727). Newton's third law says that forces always come in pairs where each of the two forces are equal in size and point in opposite directions. If you are pushing on something, it pushes back on you the same amount. When you lean against your friend, you both feel the same sized force and the force each of you feels is acting in opposite directions. When someone shoots a rifle, the force of the exploding gunpowder pushes the bullet out the end of the barrel, and an equal force, acting in the opposite direction, pushes back against the rifle which gets shoved back against the shoulder of the shooter (called recoil). When you let the balloon go, it pushes the air out the back of the balloon, so the balloon moves the other way. Like the balloon, the fire extinguisher pushes air out in one direction, so the fire extinguisher, the cart, and the rider go in the other direction. Straighten out the balloon so it will go away from you in a straight line, and not make a confusing loop. The handle on the fire extinguisher is really easy to press down. Don’t unhook the safety pin until you are ready to go, and replace it immediately after the ride. Make sure the fire extinguisher nozzle is not pointing toward the audience. The fire extinguisher is loud, you may want to warn them so they are not startled. This demo talks about another of Newton's laws. Explain the concept of action reaction. If you are pushing on something, it pushes back on you the same amount. Show this by pushing against another van volunteer. Explain that each person experiences the same sized force from the other although in the opposite direction. Tell the kids that they can try this during recess. Now move out of the way so that the other volunteer falls to the ground. Hold the end of an inflated balloon. Explain that it is full of air, and the rubber balloon is squeezing the air. Ask the kids which way it will go if you let go. Explain why the balloon moves the way it does. 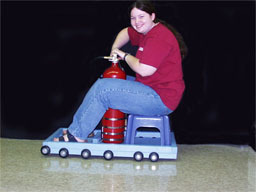 Do the same thing with the fire extinguisher cart, you can describe how the rocket cart is put together. The rocket cart works the same way as the balloon.